Parasitic, leafless perennial herb; stems threadlike, twining and sticking to other plants by means of suckers. Inflorescence of several to many stalked flowers in clusters or globular masses; flowers 1.5-3 mm long, with 5 petals/ sepals; sepals free to about halfway to the base, nearly equal; stamens slightly exserted; stigmas headlike. Capsules depressed-globose, 2.5-3 mm wide, usually not beaked; seeds usually 2. Parasitic, especially on legumes, in the lowland zone; rare in SW and SC BC; ranges over much of U.S. and S Canada. 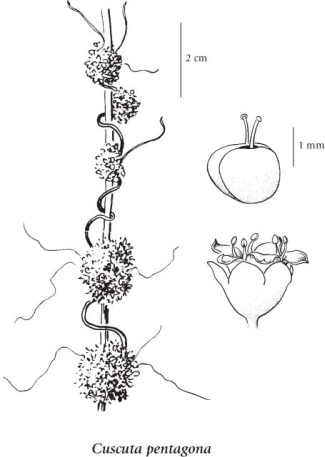 Cuscuta arvensis Bey. ex Engelm. Cuscuta pentagona var. calycina Engelm.